The Wetwing was designed by Jochen Ewert a bavarian engineer. 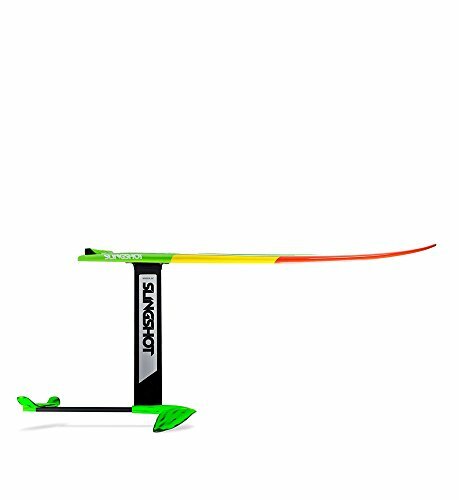 With different wings it is very fast on short and long distances and even in the slalom. Proofed on this years championships. Wetwing won the slalom, was fast on 100m and on the long distance it drove incredible 7 km only on the wing. I would like to mention that my longest flight with the Wet Wing was 20km without touching the water (1hr 55min, Lake Starnberg in Bavaria from south end to north end). My longest trip was 30km in 3hrs 15min including a 15min break (staying on the boat but floating, not flying). this is Jochen Ewert again. 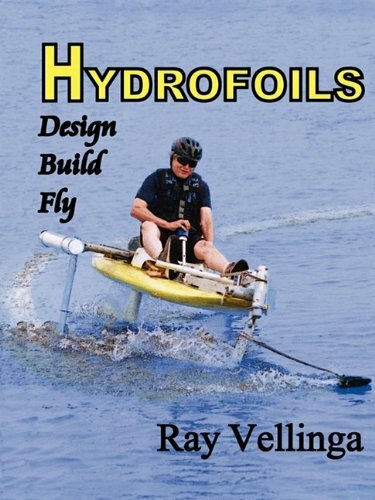 I am afraid that I have to disappoint you, but Wet Wing is a prototype built by me and there is only one unit, which I want to keep for myself. Also, I never found the time to create plans of it and it would be very difficult for some parts. Framework: Aluminum tubes, carbon fibre tubes, steel cables (very simple, very light, very stiff; I consider it as a good design). Handle bar is standard bicycle part. Seat: Styrofoam shaped by hand, coated with glass fibre reinforced plastics (epoxy). The shape is optimized for my body. The strength of the seat is optimized for my weight and muscle power (both rather low). Good ergonomics: A 10mm layer of soft foam is enough to stay hours on the boat without pain. Potential for improvement: lighter foam or honeycomb, carbon fibre instead of glass fibre. Strut (that is the surface piercing part that connects the framework with the wing): Aluminum skeleton, styrofoam coated with glass fibre reinforced plastics. 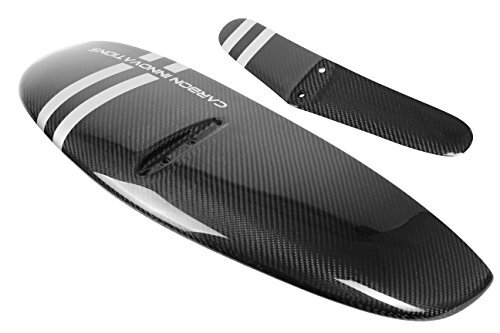 Big potential for improvement: integral carbon fibre (CRP) design, much slender shape. Wing: Carved cedar wood covered with CRP. Big potential for improvement (weight and performance): integral CRP, greater aspect ratio. Front foil: CRP, laminated in CNC milled mould. Expensive; good design. Drive train: Bicycle serial parts (pedals, cranks, bottom bracket), custom made chain ring (chain pitch 6mm: very light and smooth running), custom made drive train in the strut (second chain, also 6mm chain, Moebius band twisted design). Propeller: CRP laminated in mould by Theo Schmid of Switzerland (as long ago as 1980's). Seems to be very efficient. The boat has to be designed to your weight and power output. 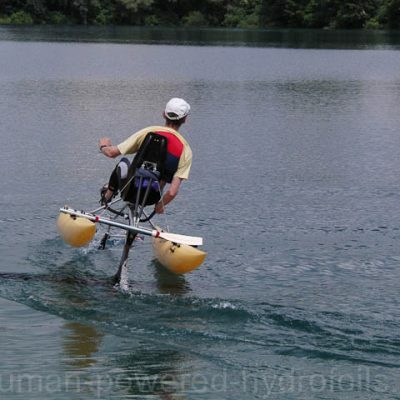 A "one-size-fits-all" design for a human powered hydrofoil is far below optimum. It would work but it's less fun. 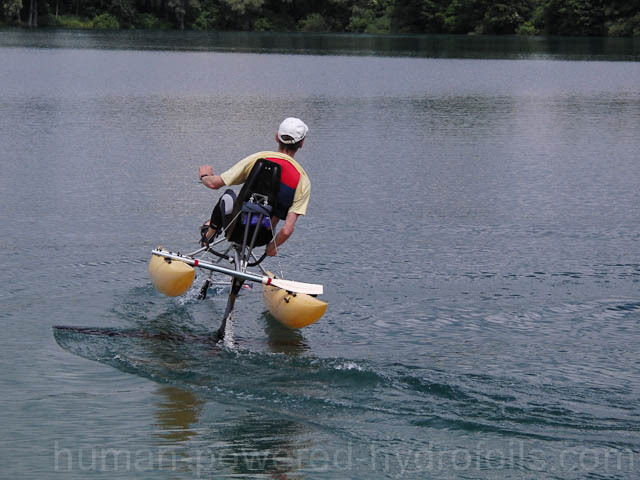 If you want to use the boat for long distance rides (10 - 20km), the weight of the boat and your weight are crucial. If the weight is high, you need high power output. In my case, boat plus rider, life vest and filled drinking bottle weigh 75 kg (! ).